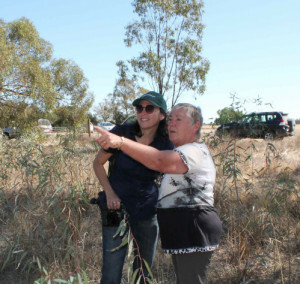 This project is part of the Loddon Plains Landcare Network’s aim to develop a greater understanding of the biodiversity within the Network’s area. The community bird monitoring project will form a baseline for ongoing data collection to observe trends and changes in bird numbers and biodiversity. Monitoring will be undertaken at 45 sites ranging from high quality remnants to isolated corridors. Data will be collected by local community volunteers every season through the 2 hectare, 20 minute bird survey methodology. 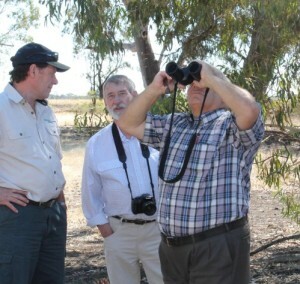 An initial data survey was undertaken by Chris Tzaros (Birds, Bush and Beyond) in summer 2014. The Network ran a workshop with Chris to introduce volunteers to the project and survey methodology that will be used. If you are interested in participating in the bird monitoring you can fill out a registration form. Experience in bird watching is desired, although there may be scope to team up with a more experienced volunteer to upskill your knowledge. A registration form can be downloaded below. Beth Mellick from The Norman Wettenhall Foundation has produced an excellent video about the project, which can be viewed via the following link. This project is proudly supported by The Norman Wettenhall Foundation. Photos: participants at the Bird Monitoring Workshop. To check out the data that has been collected by our volunteers, visit the bird monitoring data page. For stories and photos from our volunteers surveys, visit the bird monitoring stories page.